All references to companies are copyrighted and\or trademarked material. Logos, trademarks and services of the respective parties are used by permission and agreements with the vendors in the conduct of our business through specific contracts and agreements. Any use by unauthorized third parties without prior written permission is prohibited by law and subject to legal action. Links are provided to various related services and suppliers if you wish to e-mail regarding arrangements for your company. and reference "Copyright Information" in the message header. 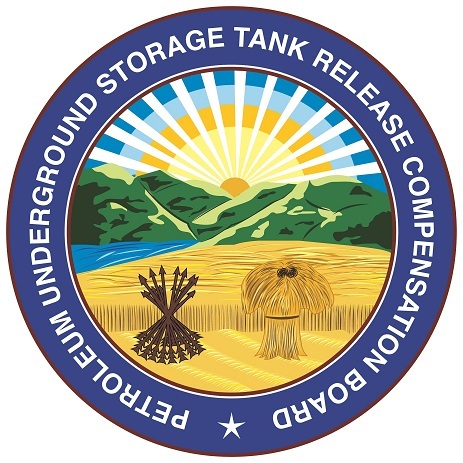 Any software that is made available to download from this server ("Software") is the copyrighted work of Petroleum Underground Storage Tank Release Board hereinafter known as PUSTRB; and/or its suppliers. Use of the Software is governed by the terms of the end user license agreement, if any, which accompanies or is included with the Software ("License Agreement"). An end user will be unable to install any Software that is accompanied by or includes a License Agreement, unless he or she first agrees to the License Agreement terms. THE SOFTWARE IS WARRANTED, IF AT ALL, ONLY ACCORDING TO THE TERMS OF THE LICENSE AGREEMENT. EXCEPT AS WARRANTED IN THE LICENSE AGREEMENT, PUSTRB HEREBY DISCLAIMS ALL WARRANTIES AND CONDITIONS WITH REGARD TO THE SOFTWARE, INCLUDING ALL IMPLIED WARRANTIES AND CONDITIONS OF MERCHANTABILITY, FITNESS FOR A PARTICULAR PURPOSE, TITLE AND NON-INFRINGEMENT. Documents specified above do not include the design or layout of the PUSTRB website or any other site owned, operated, licensed or controlled site. Elements of our websites are protected by trade dress, trademark, unfair competition, and other laws and may not be copied or imitated in whole or in part. No logo, graphic, sound or image from any PUSTRB website may be copied or retransmitted unless expressly permitted by PUSTRB. PUSTRB AND/OR ITS RESPECTIVE SUPPLIERS MAKE NO REPRESENTATIONS ABOUT THE SUITABILITY OF THE INFORMATION CONTAINED IN THE DOCUMENTS AND RELATED GRAPHICS PUBLISHED ON THIS SERVER FOR ANY PURPOSE. ALL SUCH DOCUMENTS AND RELATED GRAPHICS ARE PROVIDED "AS IS" WITHOUT WARRANTY OF ANY KIND. PUSTRB AND/OR ITS RESPECTIVE SUPPLIERS HEREBY DISCLAIM ALL WARRANTIES AND CONDITIONS WITH REGARD TO THIS INFORMATION, INCLUDING ALL IMPLIED WARRANTIES AND CONDITIONS OF MERCHANTABILITY, FITNESS FOR A PARTICULAR PURPOSE, TITLE AND NON-INFRINGEMENT. IN NO EVENT SHALL PUSTRB AND/OR ITS RESPECTIVE SUPPLIERS BE LIABLE FOR ANY SPECIAL, INDIRECT OR CONSEQUENTIAL DAMAGES OR ANY DAMAGES WHATSOEVER RESULTING FROM LOSS OF USE, DATA OR PROFITS, WHETHER IN AN ACTION OF CONTRACT, NEGLIGENCE OR OTHER TORTIOUS ACTION, ARISING OUT OF OR IN CONNECTION WITH THE USE OR PERFORMANCE OF INFORMATION AVAILABLE FROM THIS SERVER. THE DOCUMENTS AND RELATED GRAPHICS PUBLISHED ON THIS SERVER COULD INCLUDE TECHNICAL INACCURACIES OR TYPOGRAPHICAL ERRORS. CHANGES ARE PERIODICALLY ADDED TO THE INFORMATION HEREIN. PUSTRB AND/OR ITS RESPECTIVE SUPPLIERS MAY MAKE IMPROVEMENTS AND/OR CHANGES IN THE PRODUCT(S) AND/OR THE PROGRAM(S) DESCRIBED HEREIN AT ANY TIME. IN NO EVENT SHALL PUSTRB AND/OR ITS RESPECTIVE SUPPLIERS BE LIABLE FOR ANY SPECIAL, INDIRECT OR CONSEQUENTIAL DAMAGES OR ANY DAMAGES WHATSOEVER RESULTING FROM LOSS OF USE, DATA OR PROFITS, WHETHER IN AN ACTION OF CONTRACT, NEGLIGENCE OR OTHER TORTIOUS ACTION, ARISING OUT OF OR IN CONNECTION WITH THE USE OR PERFORMANCE OF SOFTWARE, DOCUMENTS, PROVISION OF OR FAILURE TO PROVIDE SERVICES, OR INFORMATION AVAILABLE FROM THIS SERVER. THE LINKS IN THIS AREA WILL LET YOU LEAVE THE SITE. THE LINKED SITES ARE NOT UNDER THE CONTROL OF PUSTRB AND PUSTRB IS NOT RESPONSIBLE FOR THE CONTENTS OF ANY LINKED SITE OR ANY LINK CONTAINED IN A LINKED SITE, OR ANY CHANGES OR UPDATES TO SUCH SITES. PUSTRB. IS NOT RESPONSIBLE FOR WEBCASTING OR ANY OTHER FORM OF TRANSMISSION RECEIVED FROM ANY LINKED SITE. PUSTRB IS PROVIDING THESE LINKS TO YOU ONLY AS A CONVENIENCE, AND THE INCLUSION OF ANY LINK DOES NOT IMPLY ENDORSEMENT BY PUSTRB. OF THE SITE.